The TOS Crew recently received one of several literature study guides from Progeny Press. 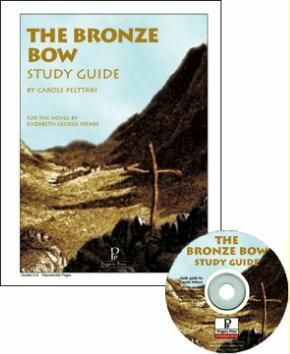 I received the Study Guide for the The Bronze Bow in the Interactive PDF version, sent through email. These study guides are also available in booklet format and as Interactive PDF files on CD. The file we received contained the Study Guide, an Answer Key and a Read Me file with instructions for how to use the interactive features. We were able to check out the book from our local library and get started right away. However, the books are available for purchase from Progeny Press. Take a peak inside the study guide for The Bronze Bow. The first of many things which impressed me about Progeny Press was the list of Study Guides they publish. Even though they have study guides for grades K-12, there is no twaddle here. These books are rich in history, character and cultural relevance, while helping your students to build a strong foundation for a biblical worldview. You’ll find guides to books such as The Courage of Sarah Noble and The Drinking Gourd for lower elementary, The Cricket in Times Square and The Year of the Boar and Jackie Robinson for upper elementary, Amos Fortune, Free Man and The Hiding Place for middle school and Fahrenheit 451 and The Last of the Mohicans for high school. There are more than 100 titles from which to choose. The interactive format makes these study guides versatile in that your student can either answer the study guide questions by typing into the PDF file or by printing it and handwriting the answers. With the interactive feature, you as the teacher can also grade and make comments directly onto the file. We are limiting our computer time right now, so we chose the print option and made a notebook with a 1-inch, 3-ring binder. We did try the interactive format just to see what it was like and Ben really liked the idea of typing his answers. I can see that in the future, we will likely use that format more, but I believe I would still print the final product to keep in our notebook. The guide begins with a synopsis of the book, introduction to the author, and some background information, as well as some pre-reading activities to get you started. This gives your student a good overview of the book, as well as information about things such as the historical time period and geographical references. For example, the Bronze Bow is set during the time of Jesus. The main character is a young boy, angry when his father is condemned to death by the Romans and vows to seek revenge. In the background information, we are given some basic information about Abraham, the history of Israel, and the clash between the Roman and Jewish cultures. As a part of the pre-reading activities, we labeled a map of Palestine (Israel) during the time of Jesus. This information helps to set the stage for the reading of the book. Inside the guide, you will find exercises in vocabulary, critical thinking, grammar, story setting and characterization, as well as a plethera of biblical reading and discussion throughout. There are also several optional activities such as creative writing, writing reports, and speech-writing. Many of the activities come in the form of answering thoughful questions, but there are also crossword puzzles, matching games and other creative ways of presenting the material. I especially liked that with vocabulary, the student is asked to write their own definition of words prior to looking for the dictionary definitions. Which reminds me . . . your student will need a good dictionary (we use Noah Webster’s 1828), thesaurus, Bible, and concordance on hand. For this study, biblical maps also came in handy. Each unit is designed to be completed in 8-10 weeks, giving your student a very comprehensive look at the book. Make no mistake, these study guides are meaty–they dig deep. They take effort on the part of the student to complete. I don’t see the need for any other language arts curriculum while we’re using Progeny Press. Progeny Press states that the goal is to teach children to think clearly, to understand literature, and to rely on scripture for truth and values, and enjoy themselves while they do it! Mission accomplished! And at a reasonable price, too. Prices range from $11.99 to $27.99 depending on the format desired. Ben reads a lot. But I don’t always know how much he’s getting out of his reading. I love that with these study guides, not only is he able to focus his attention on certain questions to provoke his critical thinking of the subject matter, but he also learning how to apply what he is reading within the framework of a biblical worldview. That is priceless and well worth the effort. See the full Progeny Press catalog. See an interactive sample of several Progeny Press study guides. Read what other members of the TOS Crew thought about Progeny Press Literature Study Guides.